Clint Eastwood is an American actor, musician and filmmaker who is well known for his roles in Western TV shows like The Good, The Bad and The Ugly, Rawhide, among other movies. He was born on the 31st of May 1930 in San Francisco, Carolina. His father goes by the name Clint Eastwood Sr. and his mother Ruth wood. His mother eventually had a second husband after the death of Clint’s father. Clint was recorded to have at least seven children from five different women. His first known child goes by the name Kimber Lynn Eastwood, she was born on the 17th of June 1964 to Clint Eastwood and then-girlfriend Roxanne Tunis. His second child is Kyle Eastwood born on the 19th of May 1968 and he is the son of Maggie Johnson. He also had Alison Eastwood with Maggie. Alison is doing well for herself as she is a fashion designer, actress, and model. Eastwood further had two children with Jacelyn Reeves and they are Scott Clinton Eastwood and Kathryn Eastwood born on the 21st of March 1986 and 2nd of February 1988 respectively. Clint and Dina Ruiz at a time, got busy and they had Morgan Eastwood on the 12th of December 1996, she is one of Clint’s youngest children. Finally, he had Francesca Eastwood with Frances Fisher on the 7th of August 1993. She is known to be a very adorable lady. What can we say? There is no doubt Clint Eastwood loves kids. Eastwood has a history or as we would call it a long list of women. The truth is, he has had it all from baby mamas to girlfriends but he officially got married to Margaret Neville Johnson (ex-wife). They were married for 31 years (1953 – 1984). On the 19th of December 1953, Clint made his first ever move towards matrimony. At this time, he was still struggling as a young actor. He married Maggie Johnson who was a worker at an auto parts supply company. They met on a blind date in Los Angeles and they got married six months after their first meet. However, the couple went their separate ways in 1984. They had two children together. Clint’s second marriage was to a reporter that interviewed him once in 1993 while he was expecting his child with Fisher. On the 31st of March 1996, the lovebirds got married. He must have really had a thing for Ruiz; as he openly made it clear to the world that she was the one! They separated after a few years and Ruiz filed for full custody of their only child Morgan. Dina is now married to basketball coach Scott Fisher. Clint and Locke were in a 14-year long relationship. They started living together in 1975; they were filming a movie at this time. Eastwood told Locke that there was nothing left of his relationship with Johnson and that with her, he had found love. Sondra indeed made the untamed Hollywood icon a monogamist until it was called off in 1995. Fisher met Clint on the set of Pink Cadillac in 1988. Two years after, she moved in with him because she felt this was heaven to her. Unfortunately, this was a similar trend with women before her. Three years after they began living as a couple, Frances had a baby girl and two years later, her matrimonial dream was shattered as their relationship came to an end. Christina is the newest lady to walk in the arms of the Western icon. In her previous marriage, she was tagged a husband beater. The courts tagged her as an ‘alcoholic spendthrift gold-digger’. Regardless of what the court or anyone else had to say, Eastwood already has his mind made up on Christina. He says he is happy with her and she seems to be loved by his seven kids. 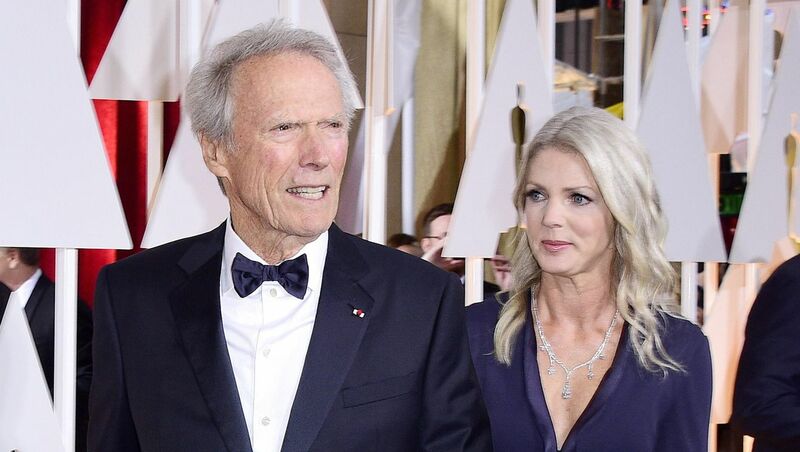 Clint is alive and well aged; the 84-year-old icon is growing stronger and stronger and still bringing in some big bucks as well as having his way with the ladies.